I think we’re hitting an iceberg, and the lookout (the Federal Reserve) is too scared to tell the passengers. In fact, the Fed is so scared, you can smell the sweat. But rather than be the bearer of bad news, the Fed is passing out party favors. So, the crowd on Wall Street keeps the party going, even as the deck starts to tilt. The Fed just “leaked” through Dow Jones Newswires that it will end the unwinding of its massive U.S. Treasuries portfolio sooner than expected. Why? 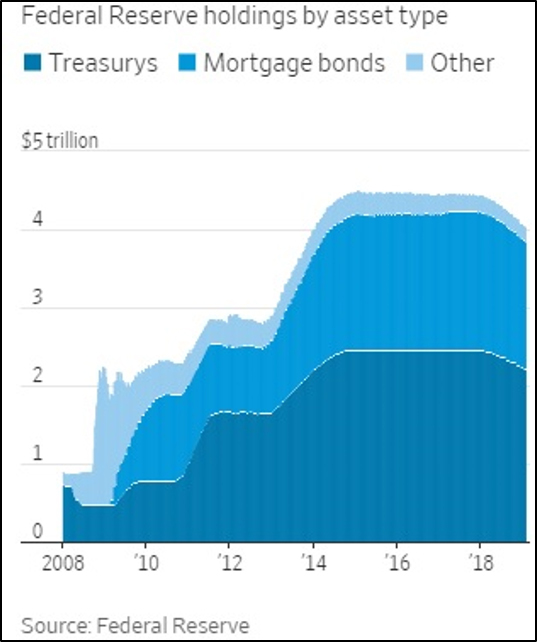 Because the liquidity from that multitrillion-dollar investment, sloshing around in the financial system, is what is propping up the stock markets. We already saw Fed Chair Jerome Powell back down on raising interest rates. Those hikes were removing liquidity from the system as well. And that terrified Wall Street — that’s why we saw stocks plunge in December. Now, the Fed is offering to keep this game of financial musical chairs on the ship’s deck going a little longer. It is desperately looking for a way out of the financial reckoning to come. A reckoning that is due after a decade of living it up on the easy money from Uncle Sam. I believe it’s time for Wall Street to pay the piper. The iceberg is grinding into our hull. There’s no easy way out. For now, though, the market is partying. The passengers are getting “free money” from the lookout! Of course they’re going to party it up. Stocks went “ZOOM” on Friday. But there is another investment that also did well on Friday. An investment that does well when the dollar sinks … when people get scared. It’s part of the market’s split personality that tells me the smart money knows what’s really going on. And that’s why, on Friday, I fired off a new gold pick to my Supercycle Investor subscribers. Why am I so confident about gold? Because I’m pretty darned sure that, despite the Fed throwing money around — and maybe because of it — there is more pain ahead. More darkness. More time for gold to shine. In that article, I said: “I wouldn’t be surprised to see stocks rally for a bit more before they roll over. Maybe to the top of this channel.” And that’s exactly what we’re getting. And when the S&P 500 finally rolls over? Well, an ordinary bear market should bring the S&P 500 down to maybe around 2,000. But what if it’s a much-worse bear market? China is the problem. Sure we know it just reported GDP growth of 6.6%. The worst in 28 years. 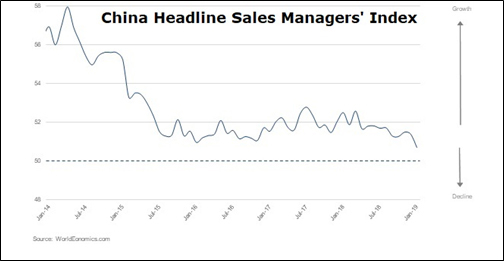 The real problem is that every other piece of economic data about China, including leading indicators, also points to a slowdown. 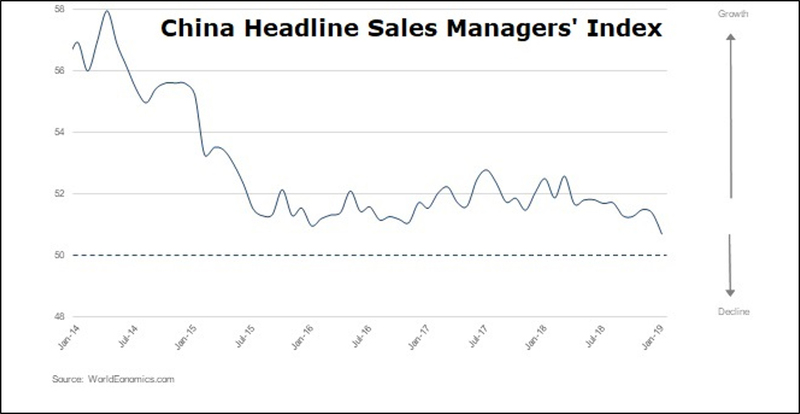 For example, here’s China’s January Sales Managers All-Sector Index. This is a composite indicator that provides the most up-to-date assessment of business activity. The SMI, as it’s known, just fell to the lowest reading on record. That. Is. Bad. News. So, it’s no wonder China is pumping money into infrastructure projects. But the bad news about China’s economy is a complicated story involving shrinking liquidity and other factors. The bottom line is that it may be very tough for China to avoid a hard landing. Especially if the U.S. and China can’t come to an agreement on their trade dispute by the March deadline. By the way, U.S. Commerce Secretary Wilbur Ross just said the U.S. is still “miles and miles” from a trade deal with China. Since a third of the world’s economic growth in the last decade came from China, China’s problems are very bad news for ALL economies. How about closer to home? Well, on Thursday, I showed you how U.S. manufacturing is rolling over. Also on Thursday, the Conference Board reported that leading economic indicators fell 0.1% in December. These indicators fell in two of the three final months in 2018. Yeah, that’s bad news, too. You know where a slowing economy really bites? When it comes time to service massive debts. 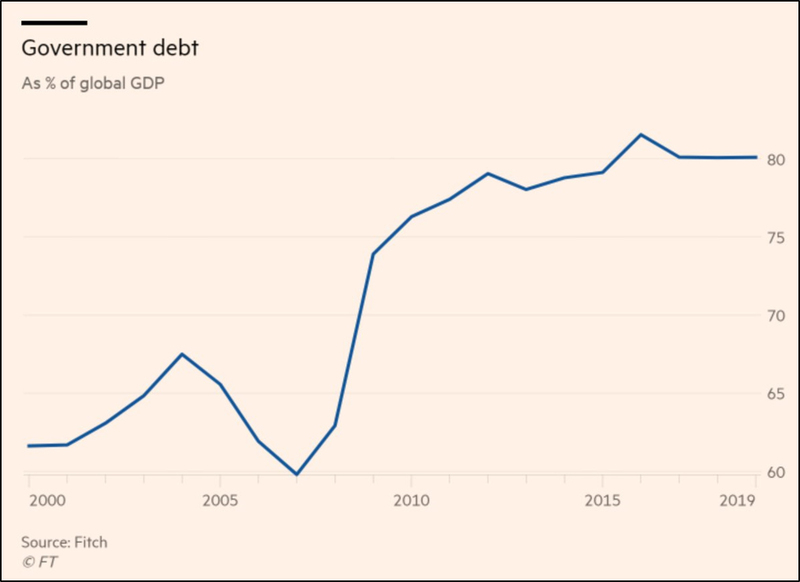 So, here’s a chart of how government debt is piling up around the world. 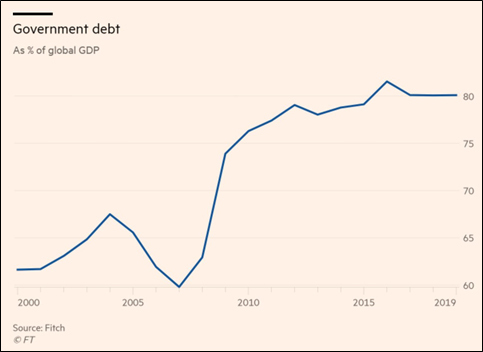 According to the latest from ratings agency Fitch, government debt around the world hit a record $66 trillion at the end of 2018. That’s 80% of global GDP. The big surge is in the United States. In fact, U.S. government debt has surged 44% since 2012! One more chart. This one comes from Goldman Sachs. Corporations, investors, traders and citizens around the globe are very uncertain about what their governments will do next. And as I’ve told you before, the more uncertainty, the more fear, the more people turn to gold. After all, the Fed may not be sounding the alarm, but they’re definitely worried about something. And the more the Fed slides into an “easy money” solution, the more gold shines. P.S. Sure, it’s a scary time in the markets. But now is NOT the time to hide under your desk. Now is the time to make money! You need to protect the money you have, and make more to bank against the hard times to come. I count not one but FOUR separate fortunes you can start making right now. Each has life-changing profit potential. And all are available not in spite of the ticking time bombs, but BECAUSE of them! What’s more, cycles research shows us that the wealth-building opportunities are immediate and they will continue for years to come. If you play your cards right, you can go back to the well and pull out triple-digit profits again and again until at least 2023. I will be online this coming Tuesday at 2 p.m. Eastern to give you the shocking facts, my forecasts and the complete roadmap for windfall profits between now and 2023. You do nothing and get run over by the coming train. You step away from the tracks and let it harmlessly pass you by. Or you hop on board and ride it to life-changing profits! Just click here to make sure you hear all the facts and get the critical information you need to not only protect yourself, but also make four fortunes. Gold may go up but it hasn’t t moved yet. A few pennies doesn’t t indicate a trend change. I’m in above $ 17.00. Three or four years ago Larry Edelson was saying that we would be able to “back up the truck” from our gold and silver investments some day soon. I followed his advice, put alot of money in gold and silver mining stocks he recommended and am still waiting for his prediction to come true. Why do you think it will finally happen now? Sean, I agree that Gold looks like a good investment with the actions the at the Fed…not sure why that is not reflected in the gold cycle chart which is showing a huge Feb decline to below 1200?